HTC announced the launch of the Desire 800 and 600 series for the US this afternoon, kicking off with the announcement of the Desire 816 smartphone for Virgin Mobile, priced at $299 off-contract. The Desire 816 features a 5.5” HD display, 1.6GHz quad-core Snapdragon CPU, 1.5GB RAM, 8GB of onboard storage with support for up to 128GB of expandable storage, 13MP rear-facing shooter, 5MP front-facing camera, and runs Android 4.4+ out of the box. In addition to the Desire 816, the Desire 610 is also launching for US customers, available for purchase through HTC’s online store, priced at $199 off-contract and $0.00 on-contract through AT&T. The Desire 610 features a tad bit lower specs than the Desire 816, packed with a 4.7” FWVGA display, 1.2GHz quad-core Snapdragon CPU, 1GB RAM, 8GB of onboard storage with support for up to 64GB expandable storage, 8MP rear-facing shooter, and 1.3MP front-facing camera. Both devices are now available, so head on over to HTC.com to check them out. HTC DELIVERS ICONIC DESIGN AND INNOVATIVE EXPERIENCES TO MORE CONSUMERS WITH LAUNCH OF THE HTC DESIRE® FAMILY IN THE U.S.
BELLEVUE, WA — August 11, 2014 — HTC, a global leader in innovation and design, is introducing the HTC Desire family of smartphones to the U.S. market, offering a breadth of models for consumers who want choice in price points and contract types without compromising on design or performance. The HTC Desire family sports many of the iconic features and experiences launched on the HTC One flagship family. Best-in-class sound – HTC BoomSound™ and its dual front-facing speakers have become instantly recognizable to HTC One users and offer a premium audio experience. Outstanding image capture, editing, effects and sharing – The advanced camera features deliver creative, professional-looking photos and amazing effects, giving consumers more choice in creating, editing and sharing photos. Consumers can tap into the unique functionality of Zoe™ Highlights, which lets consumers create mini-movies complete with personalized soundtracks and visual effects. Content integration – The inclusion of HTC Sense® 6 with the HTC BlinkFeed® experience aggregates the consumers’ chosen news feeds into a snackable experience on their homescreens. High-quality display – The HTC Desire family features large, graphic-rich screens housed within beautifully designed phones made of premium materials that feel great in your hand. Variety – The HTC Desire family will be offering a variety of bundles of features, sizes and color options in smartphones launching across multiple carriers and retailers through the end of the year. The HTC Desire 816 follows the recent availability of the HTC Desire 610 and are the first of many HTC Desire smartphones coming to the US market this year. The HTC Desire 610 packs an array of features, including a 4.7” FWVGA display, 1.2GHz Quad-Core Qualcomm® Snapdragon™ CPU, 1GB RAM and 8GB on-board storage with support for up to 64GB expandable storage. The 8-megapixel rear camera offers 1080p Full HD video recording and the 1.3 megapixel front camera is perfect for a quick video chat or snapping a selfie. The HTC Desire 816 builds on the HTC Desire 610 with enhanced specifications, including a 5.5” HD720 display, a 1.6GHz Quad-Core Qualcomm® Snapdragon™ CPU, 1.5GB RAM and the same on-board storage with support for up to 128GB expandable storage. For more serious shutterbugs, the main camera packs 13 megapixels, and also features 1080 Full HD video recording, while the 5-megapixel front camera features a wide-angle lens. Both have a back side-illuminated (BSI) sensor for enhanced captures in low-light conditions. The HTC Desire 816 will be available beginning this Tuesday, August 12, at Virgin Mobile for $299 on any of Virgin Mobile USA’s Beyond Talk no-contract plans, and at various retail outlets later this month. 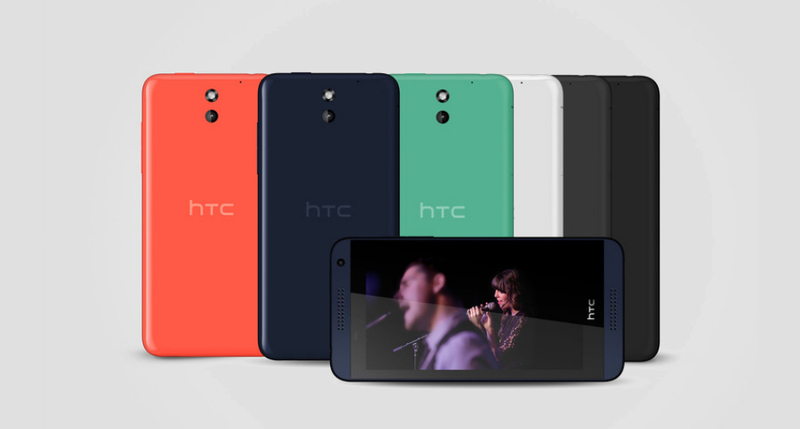 The HTC Desire 610 and HTC Desire 816 are also available through HTC.com. For more information about the HTC Desire family and other HTC products, visit the HTC newsroom.